One of Europe’s largest retained façades is being incorporated into a new steel-framed mixed-use development on London’s famous Leicester Square. Retaining London’s listed façades has become a widespread feature of construction projects in the capital during the last decade. Recent examples include Oxford Street’s ongoing redevelopment which is largely being carried out behind retained façades, while the busy thoroughfare of Kingsway and the City’s Finsbury Circus have both seen major developments that have incorporated retained elements. Whether projects involve partial or complete façade retentions, the importance of keeping these historic, and quite often listed, street frontages is vital in maintaining London’s traditional streetscape. Developers and tenants alike want modern spacious offices and the best way of attaining this on a plot, which has a listed façade, is to demolish the buildings innards while propping and retaining the perimeter walls. A new modern structure can then be built behind the walls and incorporate the historic or listed façade. One of Europe’s largest retained façades is currently being incorporated into the redevelopment of LSQ London in central London. Formerly known as Communications House, this 1920s building that overlooked one of London’s most famous squares was said to have many attractive features. However over the past 90 or so years it has been enlarged several times and had become inefficient in terms of maximum utilisation of space. “Our brief was to create a high-spec office building and we felt that the goal was not just to reimagine but reinvent, while also retaining the look and feel of the original building, which is liked and admired by so many people,” says Make Lead Architect Frank Filskow. “Our design makes the best of the existing building by retaining the historic façades, and sensitively restoring them to maintain the integrity of the original architectural features and details. The project’s main contractor Brookfield Multiplex started on site during November 2014, by which time the demolition work had been completed leaving four propped façades surrounding a cleared site. “Our first task was to construct a secant piled wall and the main central bearing piles. 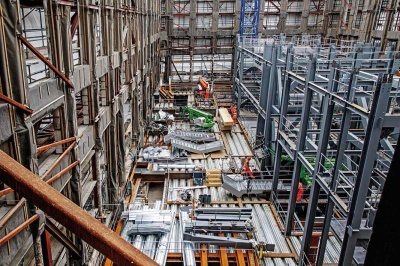 Then we excavated and enlarged the existing basement into a two-level deep facility, removing 13,000m3 of overburden in the process,” explains Brookfield Multiplex Project Director Asif Hashmi. The new steel frame is structurally independent and gains its stability from two steel braced cores. 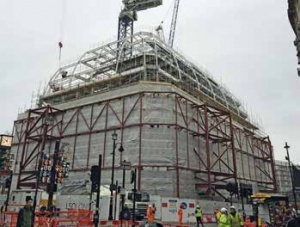 Once the temporary propping was removed the new steel frame supports and restrains the four retained façades, and so before the propping could be removed a large number of connecting brackets had to be installed. The project’s new steel frame forms two basement levels and a ground floor, which will accommodate high-end retail outlets and a main entrance lobby. Above the ground floor there are seven floors of office accommodation, five of which are incorporated into the retained façade. 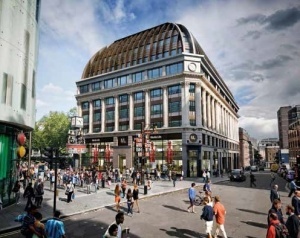 An elegant new curved roof will enclose the two uppermost floors, offering a unique 21st Century interpretation of the traditional London mansard style. The steelwork has been erected around a regular grid pattern with internal office spans of up to 15m. Cellular beams have been utilised throughout for service integration and to minimise the structural void between floors. The steel feature roof slopes outwards from the two centrally positioned cores and is formed with a cranked steel frame, which in turn supports a lightweight aluminium frame and glazing. This new and elegant curved mansard roof encloses the building and offers a modern interpretation of the traditional mansard style where arch geometry sits atop a classical base. “This respectful, contemporary addition to the building composition reduces the existing top-heavy visual mass. The curve also seeks to ensure the building blends in seamlessly with the surrounding buildings of Leicester Square,” sums up Mr Filskow. LSQ London is scheduled for completion in the third quarter of 2016. The steel-framed façade at LSQ London mostly dates from the 1920s and 1930s, however some areas, were added during the 1960s. The steel columns are all encased in Portland stone and consequently in good condition. However, steelwork originating from various decades required extensive laboratory tests to determine its make-up prior to making the welded connections for new brackets. 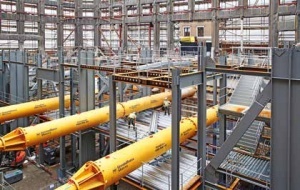 “We’ve installed a total of 250 brackets that connect the new steel frame to the retained façade’s steel-framed columns,” explains Bourne Steel Divisional Manager Kevin Springett. 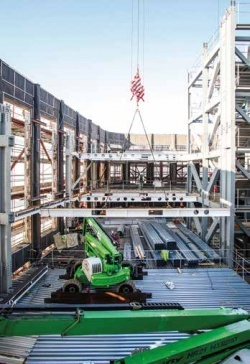 “The lab tests allowed for a trouble-free onsite welding process and as we were sure of the existing columns makeup it meant works onsite ran smoothly and efficiently,” adds Brookfield Multiplex Project Director Asif Hashmi. 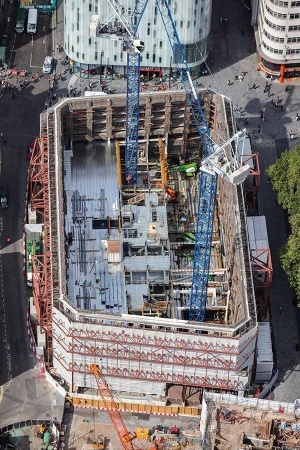 The façade retention at 48 Leicester Square demonstrates that when properly thought through, site welding is an entirely appropriate technique – and also demonstrates the adaptability of steelwork structures. Site welding is sometimes thought of as slightly suspicious, but this notion is misguided – the proposition should be that with proper consideration, site welding has the same high quality results as welding in the workshop. In other parts of the world, site welding is very common. When welding existing material, the original material must be investigated and tested. For this project, the original dates of around 1920 makes it very likely that the material was steel – slightly older and there would be a possibility that the beams were of wrought iron rather than steel. The key to successful welding (there being no difference between shop and site) is to demonstrate that a successful test weld can be produced in circumstances that very closely reflect the ‘final’ weld. A preliminary welding procedure specification will be developed, fully describing the material, all the electrical parameters, the consumables, the joint type and welding orientation. The material used in the test should be that encountered in the real situation – in this case the steel from the façade. The test piece is subject to a number of tests, which if successful, demonstrate that the procedure is appropriate and can be used with confidence. The site welding must follow, in every aspect, the parameters, consumables, welding position etc. that were proved by the welding procedure specification. Welding must only be carried out by properly qualified personnel – for the welding process, material, joint type and welding position. In some circumstances it is necessary to make special arrangements for site welding. Safe access is an obvious issue, but it may also be necessary to provide protection from the weather. Non-destructive testing should follow the completion of the welding as the final operation to assure the quality of the welding. The National Structural Steelwork Specification is recommended as the default acceptance criteria for both shop and site welding. Although site welding to existing steelwork may not be common, it can be completed safely and with confidence in the final result. For designers, there is a range of support resources that cover material and section sizes likely to be found in existing buildings, with guidance on the design assumptions at the time that may assist in any assessment of the existing structure. Specific guidance is available covering site welding.